These 4 stunning suites have been recently finished and are definitely a gem in our portfolio. Every suite is fully equiped and has modern and stylish interiors that will make you want to stay inside forever. But that would a pity, because outside you can enjoy the big community pool area with views of the ocean and the golden sand beach Playa de Amadores. The suites are located in the popular south of Gran Canaria, the place to be to enjoy the beautiful beaches of the island and explore the many shopping, dining and nightlife options that the island has to offer. Diese 4 atemberaubenden Suiten wurden kürzlich fertiggestellt und sind definitiv ein Juwel in unserem Portfolio. Jede Suite ist komplett ausgestattet und verfügt über ein modernes und stilvolles Interieur, in dem Sie für immer bleiben möchten. Aber das wäre schade, denn draußen kann man den großen Gemeinschaftspool mit Blick auf das Meer und den goldenen Sandstrand Playa de Amadores genießen. Die Suiten befinden sich im beliebten Süden von Gran Canaria, wo Sie die schönsten Strände der Insel und die vielen Einkaufsmöglichkeiten, Restaurants und Ausgehmöglichkeiten der Insel erkunden können. Estas 4 impresionantes suites han sido recientemente abiertas al público y son definitivamente una joya en nuestro portfolio. Todas las suites están totalmente equipadas y tienen interiores modernos y elegantes que harán que quieras quedarte dentro para siempre. Pero eso sería una pena, porque afuera puedes disfrutar de la gran área de piscina comunitaria con vistas al océano y la playa de arena dorada Playa de Amadores. Las suites están ubicadas en el popular sur de Gran Canaria, el lugar ideal para disfrutar de las hermosas playas de la isla y explorar las numerosas opciones de compras, restaurantes y vida nocturna que ofrece la isla. This charming holiday home for up to 4 people is perfect for relaxed holidays away from the rest of the world. 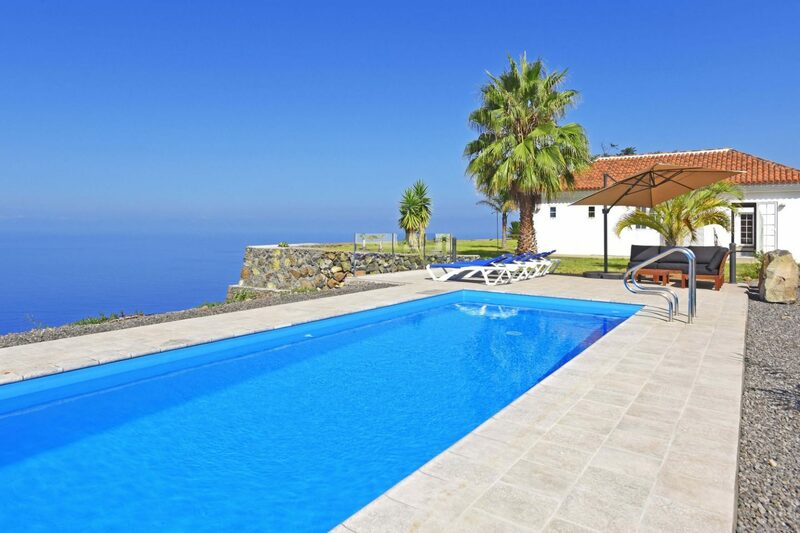 Villa de la Luz is beautifully located in Tijarafe, an area of La Palma well-known for its beautiful nature, its many hiking routes and its proximity to the city Los Llanos and the beach Tazacorte. The high wooden ceilings and the beautiful decor are a delight to the eye. You won’t miss anything in the fully equipped kitchen and there is even a fitness studio. The highlight of the outdoor area is the pool with infinite views of the Atlantic Ocean. Dieses charmante Ferienhaus für bis zu 4 Personen ist perfekt für einen entspannten Urlaub abseits vom Rest der Welt. Villa de la Luz ist wunderschön in Tijarafe gelegen, einer Gegend von La Palma, die für ihre wunderschöne Natur, ihre vielen Wanderwege und die Nähe zur Stadt Los Llanos und dem Strand Tazacorte bekannt ist. Die hohen Holzdecken und die schöne Einrichtung sind eine Augenweide. In der voll ausgestatteten Küche werden Sie nichts missen und es gibt sogar ein Fitnessstudio. Das Highlight des Außenbereiches ist der Pool mit herrlichem Panoramablick auf den Atlantischen Ozean. Esta encantadora casa de vacaciones para hasta 4 personas es perfecta para unas vacaciones relajadas lejos del resto del mundo. Villa de la Luz tiene una ubicación ideal en Tijarafe, una zona de La Palma conocida por su hermosa naturaleza, sus numerosas rutas de senderismo y su proximidad a la ciudad de Los Llanos y la playa Tazacorte. Los altos techos de madera y la hermosa decoración crean una atmósfera relajante. No echarás de menos ningún utensilio en la cocina totalmente equipada e incluso hay un gimnasio. Lo más destacado de la zona al aire libre es la piscina con vistas infinitas al Océano Atlántico. If you are a golf enthusiast, you are right here. But the same applies if you have never had anything to do with golf in your life. 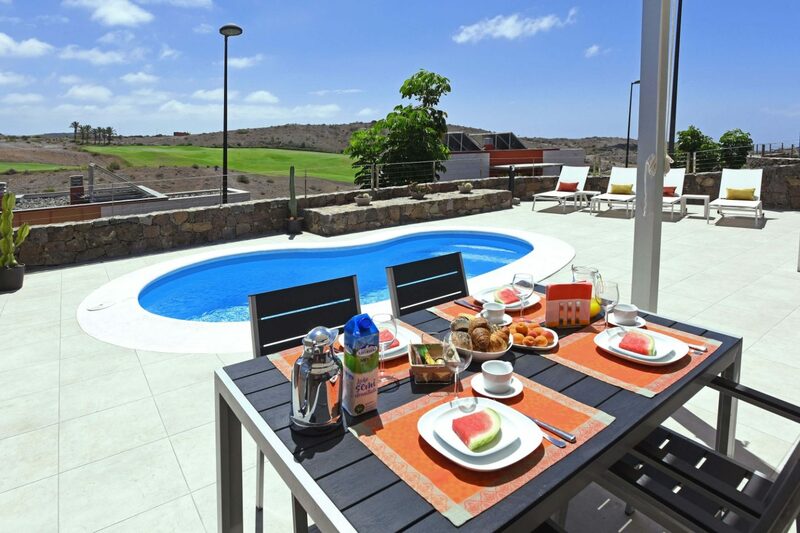 Golfers and non-golfers love the Salobre Golf Resort for its beautiful villas assembled in complexes around the golf course, the exclusive atmosphere of the resort and its supreme location next to the beautiful sand beaches in the popular south of Gran Canaria. Villa Vista Golf 15 has been recently refurnished and offers modern interiors and a big pool terrace with views to the golf course. Wenn Sie ein Golf-Enthusiast sind, sind Sie hier richtig. Das Gleiche gilt, wenn Sie in Ihrem Leben noch nie etwas mit Golf zu tun hatten. Golfer und Nicht-Golfer lieben das Salobre Golf Resort wegen seiner wunderschönen Villen, die in Komplexen rund um den Golfplatz liegen, der exklusiven Atmosphäre des Resorts und seiner hervorragenden Lage nahe der schönen Sandstränden im beliebten Süden von Gran Canaria. Die Villa Vista Golf 15 wurde kürzlich renoviert und bietet ein modernes Interieur und eine große Poolterrasse mit Blick auf den Golfplatz. Si eres un entusiasta del golf, este es tu destino ideal. Pero lo mismo se puede decir si nunca has jugado al golf. Los golfistas y los no golfistas adoran el Salobre Golf Resort por sus hermosas villas ubicadas en complejos alrededor del campo de golf, el ambiente exclusivo del complejo y su ubicación privilegiada cerca de las hermosas playas de arena en el popular sur de Gran Canaria. Villa Vista Golf 15 ha sido recientemente reformada y ofrece interiores modernos y una gran terraza con piscina y vistas al campo de golf. La Palma is the “Isla Bonita” of the archipelago and she truly deserves this title. But to enjoy the beautiful landscapes of the island, you don’t have to go on a long and tiring hiking trip. 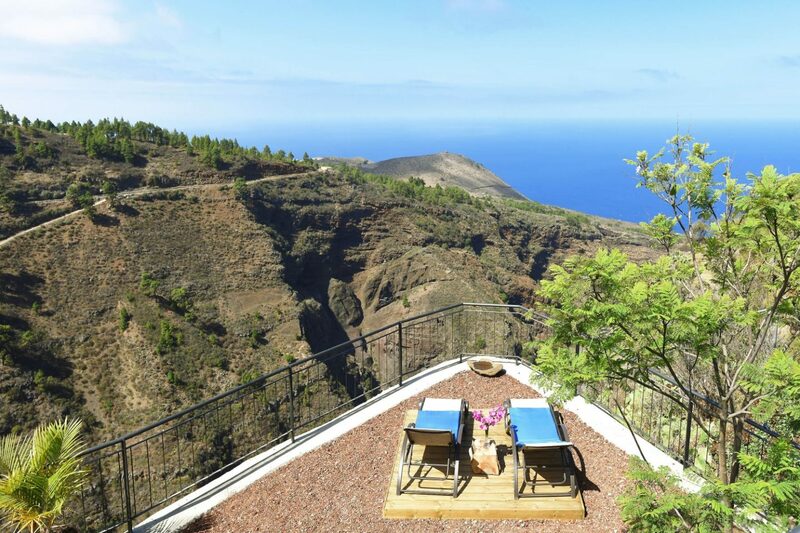 You can as well relax in the sun and drink your favourite cocktail while looking out onto a valley of volcanic origin, the green Canary Islands pine trees and the blue Atlantic ocean. Casita Julia is not only decorated with a lot of charm and individualism, it also offers stunning views to the valley of Izcagua that many nature parks would envy. La Palma ist die “Isla Bonita” des Archipels und sie verdient diesen Titel wirklich. Aber um die wunderschöne Landschaft der Insel zu genießen, müssen Sie keine lange und anstrengende Wanderung unternehmen. Sie können sich auch in der Sonne entspannen und Ihren Lieblingscocktail trinken, während Sie auf ein Tal vulkanischen Ursprungs, die grünen kanarischen Kiefern und den blauen Atlantik blicken. Casita Julia ist nicht nur mit viel Charme und Individualität dekoriert, sondern bietet auch einen atemberaubenden Blick auf das Tal von Izcagua, das viele Naturparks grün vor Neid machen würde. La Palma es la “Isla Bonita” del archipiélago y realmente se merece este título. Pero para disfrutar de los hermosos paisajes de la isla, no tienes que recorrer una larga y agotadora ruta de senderismo. También puedes relajarte bajo el sol y tomar tu cóctel favorito mientras contemplas un valle de origen volcánico, los verdes pinos de las Islas Canarias y el azul océano Atlántico. Casita Julia no solo está decorada con mucho encanto e individualismo, sino que también ofrece impresionantes vistas al valle de Izcagua que muchos parques naturales envidiarían. P.S. WANT MORE HOLIDAY VIBES IN YOUR LIFE? FOLLOW US ON INSTAGRAM!